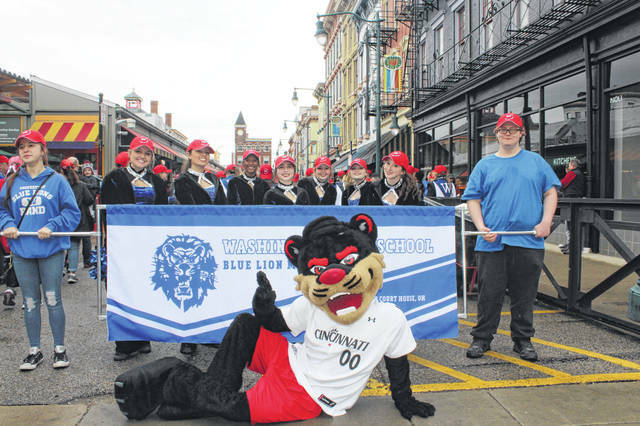 The Washington High School Blue Lion Marching band participated in the Cincinnati Reds opening day parade. First in line to represent Washington Court House were concert band members Gianna McManus (left) and Brayden Fowler (right) who carried the banner during the march. Directly behind them is the Rhythm and Blue Dance Team: (L-R) Haley Hixson, Jocelyn Trimmer, Amya Haithcock, Courtney Southworth, Makenzie Wise, Brooklynn Stanley and Ali Evans. Not pictured: Mackenzie Truex. Posing with the band is the University of Cincinnati Bearcats mascot. The Washington Court House Blue Lion Marching Band performed in the Cincinnati Reds’ annual Opening Day Parade on Thursday. The group began the day by having breakfast at Washington High School (WHS), filled three buses at approximately 8 a.m. and headed for Findlay Market in Cincinnati. Findlay Market is where the parade originates, as its official name is the Findlay Market parade. Upon arrival, the students, teachers and volunteers disembarked the buses to be surrounded by crowds of people out to celebrate the day. Everyone in the group was given ball caps to mark the 100th anniversary of the parade. Ben Streitenberger, the Washington Middle School (WMS) band director, and Greg Phipps, the assistant athletic director and physical education teacher at WMS, passed out water and fruit bars to make sure the students weren’t marching on empty stomachs. Heavy rain did occur while waiting for the parade to start. People lined up beneath overhangs on buildings and under tents. Various mascots from local sports teams hung out with the students. When the rain tapered off, WHS Band Director Matt Stanley brought the marching band members together for a warm-up. Passersby stopped to watch and cheer, and several recorded videos. According to Brenda Stanley, Matt Stanley’s wife, she and Mr. Stanley attended Ohio University with the band director at Little Miami. Not only had they all went to college together, but they had all marched together. Once the parade started, the weather began to warm considerably. Volunteers kept water provided to students who needed it during the march. Spectators were so packed along the streets that several stood and sat on the road itself. The band kept a decent pace while marching, and everytime they began their signature dance moves, the crowds would scream and cheer. At the end of the parade, students stored their instruments and stretched out. Some had to take extra caution to stretch once heavy instruments were removed. Students were provided with a lunch from WHS that had been stored in adequate temperatures for them. It consisted of subs, applesauce, water and bagged snacks. Everyone gathered to eat on a grassy patch and walkway where the buses had been directed to park. Students rested in the shade, laughed off their exhaustion and simply rested as their teachers finished packing everything up. After students had used the restrooms, they filed back onto the buses for the trip home. Nyleah Trimmer, the advisor for the Rhythm and Blue Dance Team, agreed and added, “The crowd was very receiving.” She explained that the band has a very unique style that is entertaining for people to watch.